What's the Cause? What Can be Done? Thoracic outlet syndrome is many times overlooked or misdiagnosed due to the difficulty in distinguishing what the problem is and the variations that make up this syndrome. The thoracic outlet is the space between your collarbone and your first rib. It runs from the neck to your shoulder. The brachial plexus nerve bundle, and subclavian artery run through this space. The definition of thoracic outlet syndrome is “compression of the brachial plexus nerve and subclavian artery by attached muscles or bones in the region of the first rib and the clavicle”, or from the neck to the armpit. The brachial plexus is the nerve bundle that innervates (serves) the shoulder girdle, arm and hand. The subclavian artery deals with the blood supply for the shoulder, arm and hand. There are several scenarios that could cause thoracic outlet syndrome symptoms, including hypertonic muscles (weak, poor tone), trigger points, an elevated first rib, injuries, weight gain, postural imbalance such as forward head posture , or an extra rib (“cervical rib”, less than 1% of population has this). This syndrome is a broad term that involves several potential causes in the same area. It varies depending on which area is compressed and what is compressing it. Symptoms include neck, shoulder, arm and hand pain which gets worse with activity; numbness, weakness, impaired circulation to the arm; hands becoming very cold; edema, swelling or redness in the arm and hand, or absent pulse. The symptoms usually worsen when the arms are extended over the head for any reason. About 90% of the time it is entrapment of the nerve, for the rest it is a vascular problem. 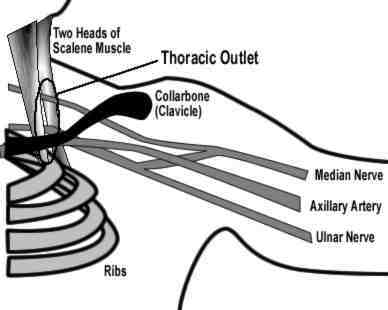 The nerve bundle first passes between the anterior (front) and middle scalene muscles in the neck. It then goes underneath the clavicle continuing underneath the pectoralis minor muscle before dividing into different nerves down the arm. The nerve can become compressed in several areas. What Causes the Nerve Entrapment? 1. Compression between the anterior scalene and the medial (middle) scalene muscles. The nerve, artery and vein are sandwiched between them. Hypertonic (tight) scalene muscles or trigger points in the scalene could be the cause. Massage therapy could help this problem. 2. The nerve or artery becomes stretched and compressed under the pectoralis minor muscle as its tendon attaches to the coracoids process on the back of the scapula (shoulder blade). A tight pectoralis major or minor muscle would press the nerve bundle against the bone. Massage therapy could help this condition, as well. 3. The collarbone and top rib could be too close together, causing the nerve to be compressed between them. Two scenarios could cause this. One being that the collarbone and rib are too close together and surgery to remove some of the bone would be needed. The other would be the scalene muscles which attach to the first and second ribs are too tight, pulling the rib up to press on the collar bone. The scalene muscles lift the first rib in breathing. Massage therapy could help the second of these two. 4. An anatomical cervical rib found in less than 1% of the population. This is a bony extension on the transverse process of the 7th cervical vertebra that usually has a fibrous connection to the first rib. This extra rib extension can sometimes place pressure on the brachial plexus as it has to cross over the extra rib. This condition might require surgery to remove the rib. Massage therapy would not help. Because the symptoms are similar it is hard to distinguish where the compression problem lies. There is no single test available to diagnose where and what the problem is. It’s mostly a matter of trial and error with many tests, eliminating one problem at a time until the correct problem is discovered. Therefore, conservative therapy is beneficial. A thorough history should be taken to see if a lifestyle change can help with the problem. Things like poor posture, trauma, repetitive activity, weightlifting which causes bulk muscle mass, and other upper arm sports movements might be causing the trouble. Many times massage therapy, physical therapy, postural realignment, or eliminating things like repetitive activities that aggravate the symptoms could be all that is needed. Still some diagnoses would require surgery. Unless you know the problem is clearly one that needs a surgical procedure you might want to try some simple things before the invasive surgery. Tests a doctor might use would be x-ray, CT, MRI or ultrasound, blood or circulation tests and nerve tests to help diagnose thoracic outlet syndrome. A simple test to identify if thoracic outlet syndrome is your problem is to elevate your arms straight over your head, then open and close your fists for approximately 3 minutes. If your symptoms are present when you do this test you might have thoracic outlet syndrome. 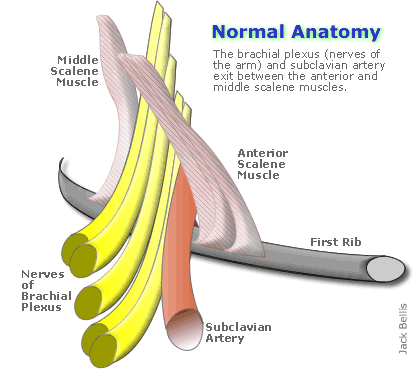 Compression of the brachial plexus nerve bundle can affect any of the nerves that go down the arm. The medial nerve is affected the most, however, because of its position. The medial nerve comes from the C8 and T1 vertebral nerve roots and eventually become the ulnar nerve further down the arm. Therefore, thoracic outlet syndrome affects the ulnar nerve more than the others and sensory symptoms many times are felt in the ulnar nerve distribution in the hand. If median nerve fibers are affected, the symptoms can be mistaken for carpal tunnel syndrome. Inaccurate diagnosis of this can lead to unnecessary surgery for carpal tunnel when in fact thoracic outlet syndrome is the real problem. If the problem is muscular, massage therapy may very well alleviate your symptoms. Constant muscle tension in the neck or muscles withtrigger points could compress the nerve or artery, or press them against bone. Other possible treatments should include postural retraining and structural alignment, muscle strengthening and stretching. When non-intrusive solutions do not work, surgery might be the alternative. With surgical repair of thoracic outlet syndrome part of the bone or muscle might have to be removed or scraped to make space for the nerve or artery. If massage therapy is used, the therapist would check the scalenes and pectoralis muscles for hypertonicity and check all areas for trigger points. There are also some stretches that could be used for keeping the tightness out of the muscles. Working with the client, the massage therapist would need to find out if anything the client is doing in daily life is causing the problem. Then the two would work together to correct that, whether it be poor posture, or repetitive work, or sports related movements that are aggravating it. It’s sometimes hard to identify the cause and anatomy involved in thoracic outlet syndrome, but massage therapy would be a good, safe place to start, regardless.